ORLANDO -- SAP shed light on its in-memory computing strategy today, announcing plans that will apply both to customers on ECC 6.0 and versions of R/3 back to 4.6. Hasso Plattner explained his plan to fit in-memory databases into customers' existing landscapes, dubbing the effort "Enterprise 2.0" and saying he expected it to be bigger than the release of R/3. A copy of the relational database will be created that will connect to and work in parallel with that relational database. He assured critics that "it works fine." Plattner explained SAP had learned from customers that while they were interested in the in-memory database, they "currently have no money, they currently have no time, and they don't want to risk what they already have." "Instead of moving forward, we have to move back," Plattner said. "We have to apply the new technology to the existing base." It was an acknowledgement that much of the customer base has yet to move to the most recent release of SAP's ERP software – ECC 6.0. Co-CEO Jim Hagemann Snabe said that SAP, compared to any other vendor in the market, has the largest proportion of customers on its latest release – more than half. But until they are ready to move to the latest version, they will be offered the ability to innovate using in-memory technology. But Hagemann Snabe didn't say whether SAP would extend support for those on R/3 releases beyond the current timeline. And for the many customers who have yet to upgrade, there is some good news, according to Plattner. Not only does the in-memory database dramatically increase performance and reduce storage, but once the database is in memory, new tables and new attributes can be done on the fly, dramatically simplifying upgrades. "No Easter weekends, no more Christmas holidays," said Plattner, who demoed his vision using an iPad and a production planning application. "This can be done anytime. For many of you, this will be a huge relief. Go there are quickly as possible is my advice." Some users at Sapphire echoed Plattner's excitement. "It's impressive," said Antonio Galdeano, senior manager at the retailer Liverpool which is currently running SAP ECC 6.0, among other SAP applications. "It's going to change the way of reacting, making decisions in the company." His colleague, Oscar Basurto, director of management and inventory planning, agreed, "I hope we can have this made available in a short time. It will make my business much more productive." SAP also announced it's working on building an appliance with HP that will act as a "supercharger" for BW, dubbed the high performance analytical appliance. It will allow BW to connect to non-SAP data sources, and provide the ability to do analytics on data, including real-time analytics and predictive analytics. SAP said it's currently working with customers on developing it, and it will be available in the next year. SAP also detailed its plans for "Project Gateway," in which it will leverage partnerships made with Microsoft and IBM to develop applications for mobile devices. Gateway will be part of Duet, Alloy and a system SAP's building with RIM to connect SAP applications to the BlackBerry. SAP also announced the first of its line of business, cloud-based applications for large companies. SAP reworked Carbon Impact, the ClearStandards on-demand carbon management product it acquired last year, to run natively on Amazon. It will be available in July. 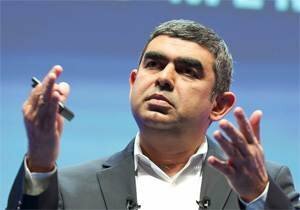 "The way we see the value of cloud computing is in simple, easy to use solutions, connect and integrate into existing systems," said CTO Vishal Sikka. "This is the first application we are building on this cloud platform for simple extensions. There are more to come." Sikka was clear that SAP believes these initiatives will help customers get more value out of what they have in place already—something that has been a constant complaint. Sikka also tried to reassure the audience of the future of NetWeaver, saying all of these initiatives would be based around it. "What happened to NetWeaver? All of this that I show you today is NetWeaver," he said. "We believe Netweaver is the platform for enterprise business solutions."